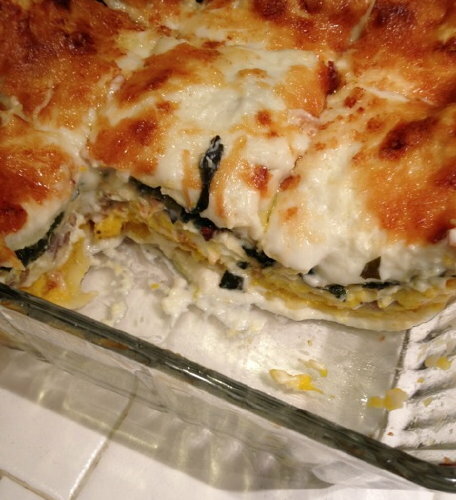 Autumn Lasagna - Get the Good Stuff! Not the ordinary tomato-and-such lasagna, this one features the flavors of Autumn: squash, sage, sausage, and green chard. It was originally posted in October 2012, when my CSA share included 25 pounds of squash! Don't wait for desperate times to make this, though: it's perfectly wonderful, and worth going through all the steps. It's a splendid way to use up leftovers as well. Autumn lasagna carries the flavors of fall: roasted squash, sage, sausage and cheese combine to make a memorable dish. It’s no more complicated than any other lasagna: there’s a sauce, there are noodles, and there are fillings that get layered in. Heat a large skillet over medium-high heat. Crumble the sausage into the skillet, and brown it over medium-high heat. Set the cooked sausage aside. In the same skillet, sauté chard, stirring often, for 4-5 minutes, until it is all wilted. Remove the chard and set it aside. Slice the fresh mozzarella in thin slices, and set them aside. If you are using the type of noodles that must be cooked before use, cook and drain them, and set aside. Have about a half cup of grated Parmesan or Romano cheese (or a blend) ready for use. Add sage leaves to the milk and heat it to infuse the sage flavor into the milk. In a large saucepan, melt the butter. Add flour, stir well, and make a roux, stirring for 3 min or so. Whisk in the milk, stirring well. Heat to a full boil, stirring frequently, and cook until thick. Remove the pan from the heat. Leave the sage leaves in there for now; they’ll just add more flavor. In a separate bowl, beat the eggs with the nutmeg and a bit of salt and pepper. Slowly pour the eggs into the Bechamel sauce, whisking constantly. Add the grated cheese, and whisk until that is incorporated. Now you can set this sauce aside. Assemble the lasagna! You could use a 9×13 pan, but I wanted to keep a small one in the freezer for later, so I used one 8×8 and one loaf pan, which is a perfect one-noodle lasagna size for two people. At any rate, grease your pan(s), so the lasagna won’t stick. Heat your oven to 375˚F. Remove sage leaves from the sauce. Assemble the lasagna layers in this order, making sure to end with a layer of noodles covered with sauce. My baking dishes were getting full, and being a cautious sort, I put them on a half-sheet pan so any drips wouldn’t hit the oven floor. Cover the dishes (use foil if you’ve no lids) and bake at 375 about 30 minutes. Uncover, sprinkle the tops with the last of your grated cheese, and return to bake 20-30 minutes more, until the cheese is well browned, and the lasagna is bubbling hot. Remove from oven, and let stand, uncovered, at least 15 minutes. This lets the dish firm up, so the layers don’t slide apart when served. As I mentioned, I made one part of this in a loaf pan, so that I could freeze it and enjoy at a later date. I did NOT add the finishing grated cheese to the top of this one. When it was cool, I wrapped it well and froze it. Later on, I will thaw it overnight, then stick the thing in the oven, this time WITH the last bit of grated cheese on top, to heat through and brown the cheese. It will be just as wonderful.